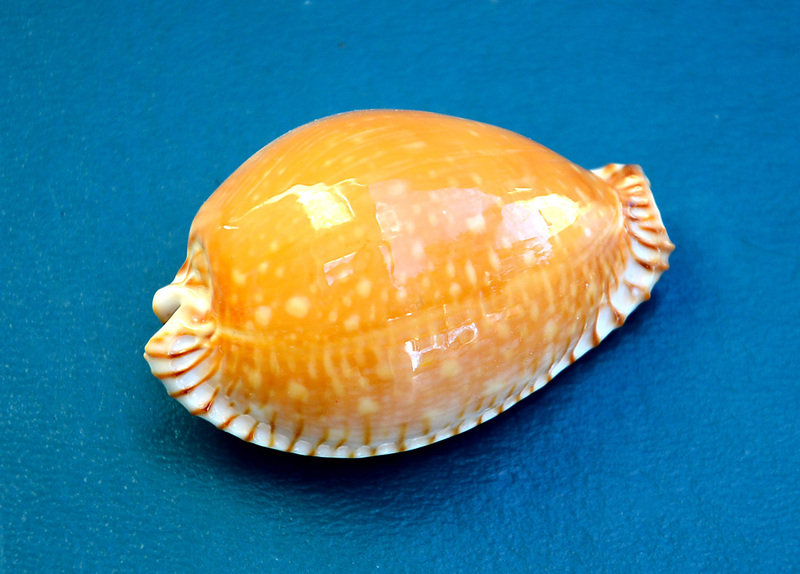 Cypraea guttata, Gmelin 1791 is one of the most exquisite of all shells. Until recently it was also one of the rarest. When Burgess wrote his monumental book “The Living Cowries” in 1970, he stated that there were fewer than 20 known specimens. Today due to the Asian commercial fishing fleets trawling in deep water, specimens consistently come to the market. Cypraea guttata has an orange dorsum with white “drops”; The extremities are rostrate and spiny. The prominent teeth extend the width of the base and are deep brown stained contrasting to a white base. The variety Erosaria guttata azumai, which is presented here, was not known until Schilder described two dead collected specimens from off the coast of Japan in 1960. Today specimens collected in the East and South China Seas are the ones most likely to be offered by dealers. Cypraea guttata guttata, Gmelin 1791, the Philippine variety and first described is the hardest to acquire. They grow to the largest size and these big specimens are incredibly striking (and super expensive too!) Cypraea guttata surinensis, Raybaudi 1978 which comes from the Andaman Sea is the most vibrant with a richer color and almost black teeth. It also tends to bring the highest prices. Because most specimens come from commercial trawling, too many substandard and immature specimens reach the market. This specimen though is in gem condition, average in size, and exemplifies the reduced spotting that is typical of the azumai variety. It was trawled in 2008 at 200 meters deep off the coast of Zhejang Province near Ningbo City in the East China Sea. The shell was purchased direct from China and donated by Richard Kent.